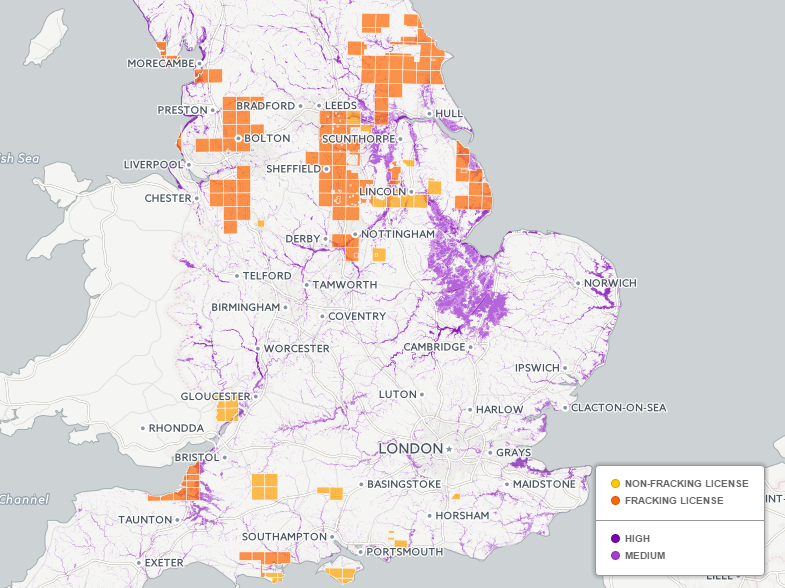 Almost 20% of fracking licence blocks offered by the government substantially overlap with zones at significant risk of flooding according to a new analysis by Unearthed. The news comes in the wake of severe flooding in Cumbria and Lancashire – some of the fracking blocks also appear to overlap with areas which have recently been flooded. 23 out of 124 blocks offered to firms as part of the 14th licensing round were significantly covered by areas at a high or medium risk from flooding, while almost all of the rest of the blocks are partially covered. The analysis highlights one of the challenges faced by shale gas operations, which must ensure chemicals and flow-back water from drilling is kept from entering the ecosystem. An Environment Agency spokesperson suggested they will object to fracking developments if flood risk is unacceptable – or need special conditions to be met in order for sites to be permitted. This could make it much more difficult for large swathes of land to be opened up for shale gas exploration. Meanwhile, the government’s planning guidelines suggest it may be prepared to consider developments in flood risk areas – so long as measures are in place to manage risk. The government’s Strategic Environmental Assessment on onshore drilling said it was impossible to assess flood risk so far because drilling sites were unknown. However the consultants noted that drilling could increase flood risk – for example by removing vegetation or putting down solid surfaces and that “should the site become flooded during exploratory drilling, production, operation or decommissioning, adverse effects could occur”. In the 14th licensing round, 63 licenses were offered for shale gas drilling or exploration – while some of these licences covered multiple blocks or parts of blocks (124 in total). Only two sub-blocks (0.1% of the fracking blocks) didn’t have any significant flood risk, because rivers flow over much of the UK land area. Coastal areas are also vulnerable to the risk of flooding. The analysis was made by visually comparing the Environment Agency’s Risk of Flooding from Rivers and Seas geospatial data with the most recent oil and gas blocks where there could be fracking – by overlaying them on the above map. When flood risk areas covered around a quarter or more of the block, the block was deemed to be a “substantial overlap”. Only high and medium flood risk were used in the comparison, with over a 1 in 30 risk of flooding and between a 1 in 30 and a 1 in 100 risk of flooding per year, respectively. Flooding can present a problem when planning where to frack – and as we have shown this will affect some blocks more than others, though almost all are affected. Early last year, an Unearthed analysis showed that an area of inundation around Bridgwater in Somerset overlapped with where fracking could take place. The area often floods. The floods in Cumbria and Lancashire last week – as a result of heavy rainfall from Storm Desmond, which was exacerbated by climate change – also may have overlapped with some areas fracking may take place. There are 10 fracking blocks that overlap with Lancashire. Several of these are to the east and north-east of Blackpool, where there were flooding alerts on 5 December (shown below) – though these weren’t as severe as in Cumbria. There are also four fracking blocks (or parts of blocks) that have been offered in Cumbria, near Barrow-in-Furness, an area that previously flooded in 2012 and 2014. Although we don’t know the exact locations of the 33 fracking wells that are committed to be drilled – or the 35 that might be – and so can’t be sure that the wells will overlap with flood plains, the Unearthed analysis highlights the potential risk. Flooding of fracking sites in Colorado in 2013 prompted a number of spills, though testing did not find large-scale water contamination. Flood Risk Assessments could have to be considered as part of an Environmental Impact Assessment (EIA) for a site, depending on whether they are deemed necessary.